Now however, was the time to be. It was fairly easy to find a date on when her vacation from work would match my vacation from studying in London. The only complicated thing is to get a visa for stay as a tourist. Before one can even apply for a visa, one needs to have an official invitation by some inviting institution. These invitations can be issued by individuals in Russia, however, this is rather complicated. So there is now a little industry of institutions issuing invitations for some renumeration. In my case, I got my invitation basically from some firm, which kindly also gave me a fake booking in a hotel. I received the invitation as an email and was asked to print it out with black ink only (so that it looks like a fax). Furthermore, for entry as tourist to the Russian Federation, you need to get a travel insurance. The Russian embassy provides a list of insurance providers, whose travel insurance they accept. After all this information is compiled together in the application sheet, you can either again ask an agency to deal with the proceeds or you can send the application directly to the embassy, provided you paid the fee. However, on my trip to Moscow I met a French girl who tried to do it this way. She said that they just rejected her application for a minor mistake – she did not glue the picture to the application, but only attached it with a pin. Due to this she had to pay another visit to the Russian embassy (and pay again the fee). She said that it is fairly normal that about every other application is rejected. With an agency, you dont need to show up in the embassy and they check over your application etc. to make sure the application is not rejected for trivialities. So it might just prove to be a good investment, by actually asking an agency to get the Visa. In my case, it took around 4 weeks for the whole process. If you need it faster, I guess you can pay more. Flights to Moscow are fairly cheap if you book ahead of time. I flew with Россия (which is Rossya in latin letters) from Munich via Санкт-Петербург (St. Petersburg) to Москва (Moscow). As I booked rather late, I didnt get a direct flight. The return is direct however. Note if you book a flight to Москва, there are at least three airports. The international airports are Domodedovo airport and Sheremetyevo Terminal 2, however, Sheremetyevo is only used by Russian airlines and not European ones. So Lufthansa would exclusively fly to Domodedovo. For entry to the Russian Federation, you need to fill out an imigration form, which you get in the plane. It is a bit confusing, but fairly straightforward. Note that at entry to the Russian Federation you get one slip of the immigration form, which you need to hold onto until exiting the Federation again. The airport in Санкт-Петербург is a bit confusing but small enough to not get lost. 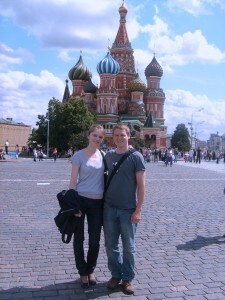 It took the French girl and me about 1 hour to find the correct place to check our luggage in for the flight to Moscow. People tried to be helpful, but with close to no knowledge of Russian language it is not that easy to follow descriptions of where to go. However, we made it! Alena picked me up from the airport and we took something like a transfer taxi, that follows a route; it dropped us off at a МЕТРО (subway) stop from where we took it all the way to the south of the city (as Sheremetyevo is in the North). Alena gave me right away the hint that I should not talk around policemen in English, as this would just provoke being questioned. Also, make sure to have the telephone number of your embassy with you. It might happen, that you still get stopped by the police. They will ask you for your passport and not return it, or only for a small “fee”. In this case, it is suggested to just call the embassy. However, so far, no policemen had any interest in me. Supposingly, I look Russian enough to be asked by Babuschkas for the way to the next Metro stop in Russian. Also, if you want to visit Museums: foreigners have to pay sometimes up to twice or tripple the admission as Russians. I seemed to pass as Russian and got in for close to free in some Museums, where they do not check IDs. So it is worth a try, in the worst case you can always play “dumb tourist”.